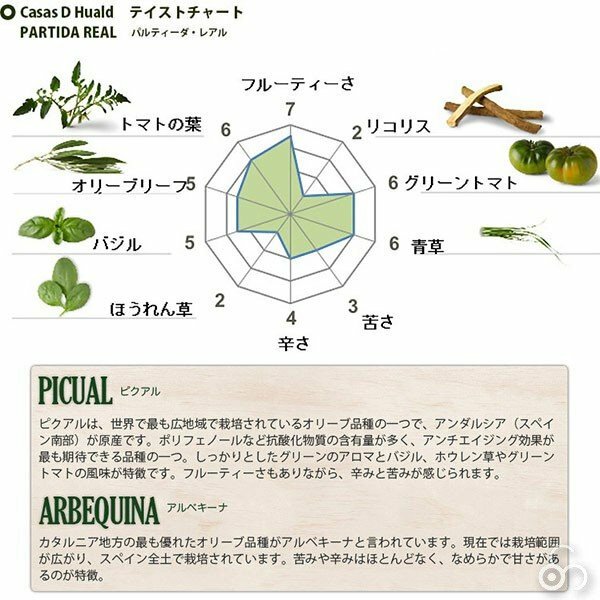 The extra virgin olive oil which pursued the best balance and harmony from avant-garde olive noble olive farm umbrellas デ ウアルド cultivating in Spain is available. A beautiful flight of the Golden Eagle growing up only in Nature is imaged. 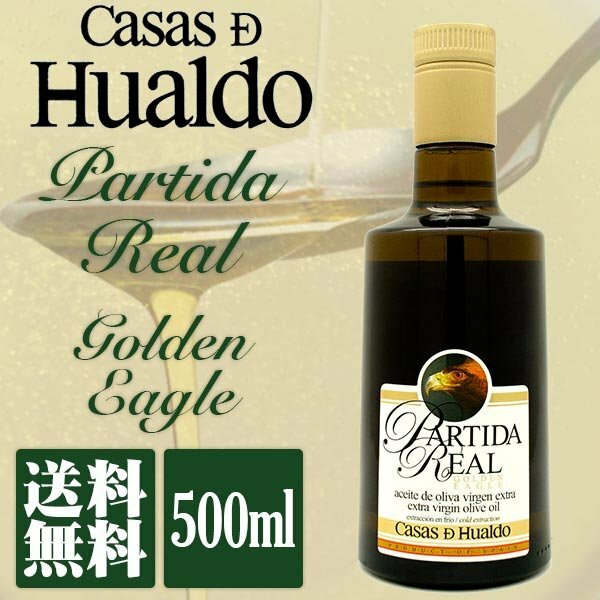 The number that the acidity expresses the freshness almost the life of the olive oil. As for the number called 0.1, a market is the best. The extremely fruity oil that I let you feel eloquence of the fresh mint and herb, and the sweetness of soft banana is fragrant. There is evidently the spy sea and can enjoy the comfortable fresh taste of Artie chalk and the green tomato. 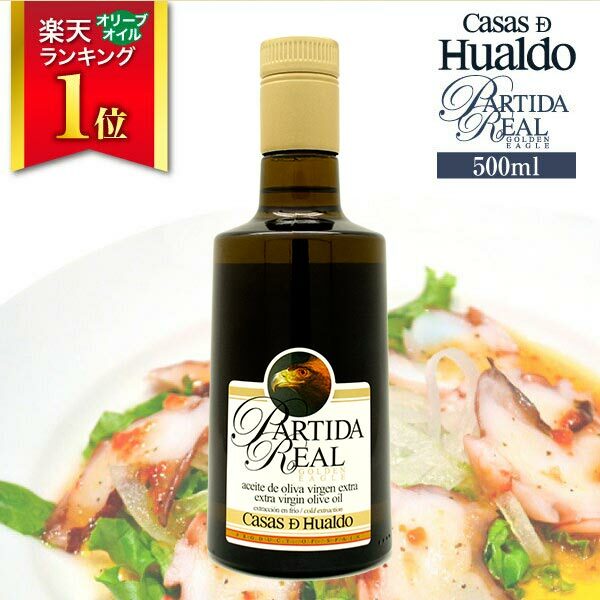 The olive oil that it may be said that it is ideal that both the oleic acid and the polyphenolic content are high and spend everyday life in good health. I can expect a high antioxidant action. The further cost performance is high-performance extra virgin olive oil not to be able to overlook. Where does the amount of production of the olive think many countries most all over the world? In fact, Spain is the amount of production world first place of the olive. Did the most of the world olive oil know a fact cultivated in Spain? The cultivation of the Spanish olive is carried out for a long time in the bank part of the Tagus river flowing through the Toledo prefecture, and a fact cultivated from the Middle Ages when a Christian and a Muslim coexisted remains for the record. The climate is cold in winter strictly, and the trees such as olives are hard to be accompanied by an insect as it is dry and reaches the high temperature hotly in the summer, and it is said that I am protected from a pest and a disease naturally. 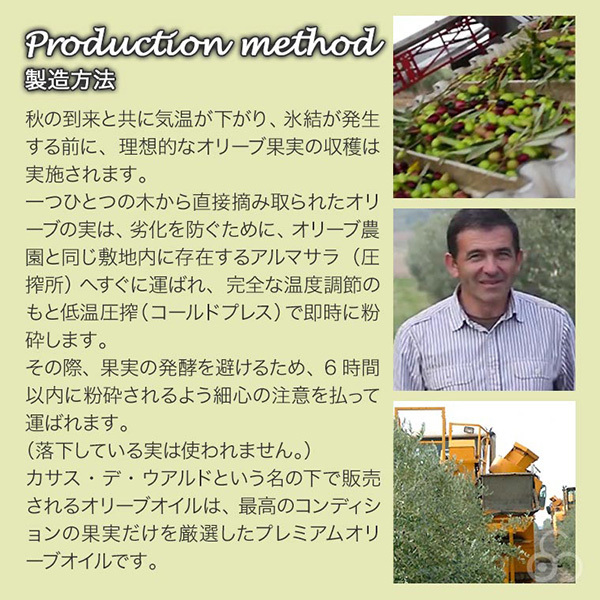 It is the reason that such a climate condition is suitable for olive cultivation. 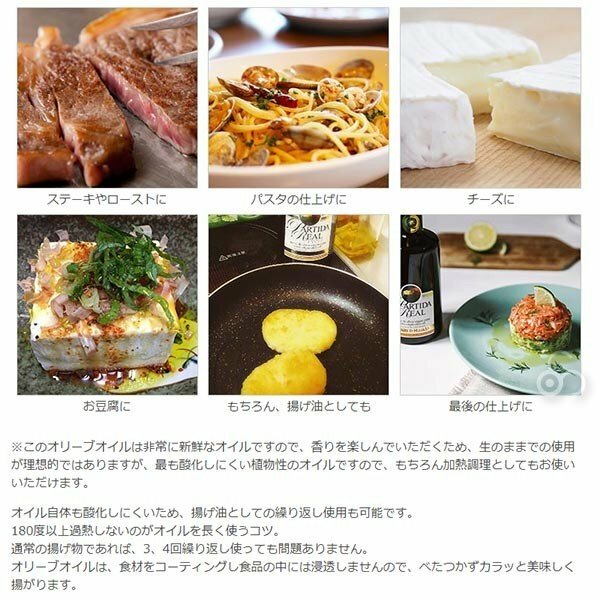 In addition, in Spain Greece Italy Morocco Cyprus Croatia Portugal, Mediterranean Sea dish eaten in each country is registered as Intangible Cultural Heritage of the UNESCO. The center of the food culture cannot miss existence of the olive oil. There is right no exaggeration even if Spain says "the country of the olive". 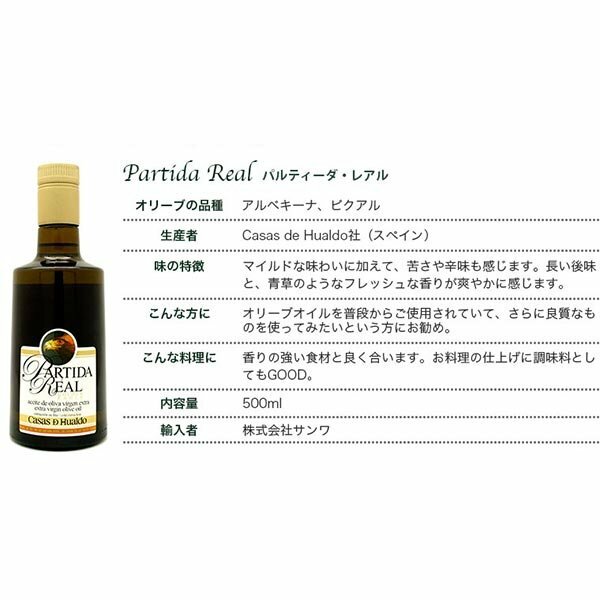 The パルティーダ real is a special blend article created from Spanish olive brand, umbrellas デ ウアルド company. 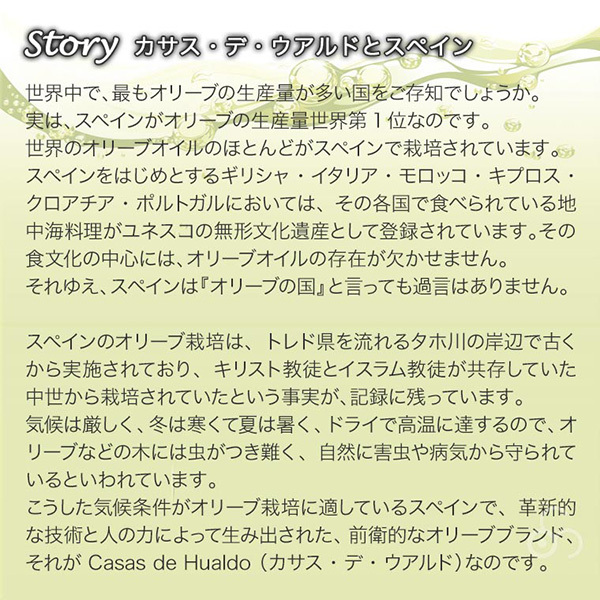 Farm umbrellas デ ウアルド which began by alone Francisco Ribera of the Spanish best-known businessman in 1986 was reclaimed land small at the start, but changed a figure into the huge farm which put an olive cultivation technology latest now, and was developed. 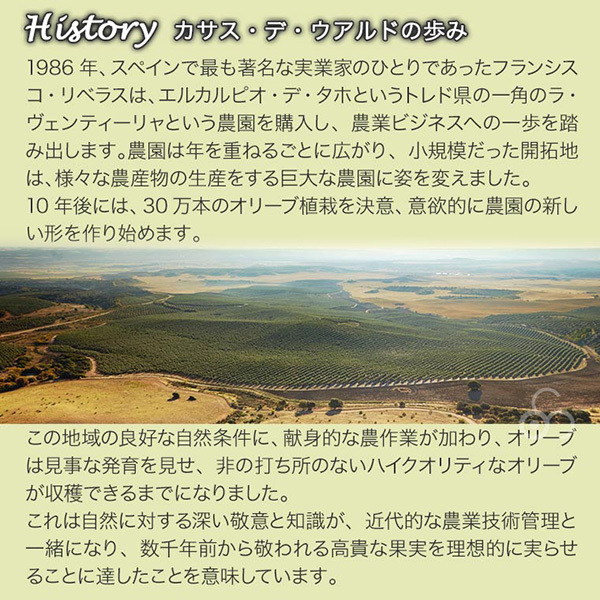 The ウアルド farm exists at the position from 400m above sea level to 600m. It is cold, and it is severe environment reaching a high temperature with dry hotly in the summer, but that is why the trees such as olives are hard to be accompanied by an insect, and it is said that I am protected from a pest and a disease naturally in winter. Because the process when the fruit of the olive of the high quality, sensitive flavor is settled for has few precipitations, I cannot miss the existence of the modern irrigation system taken in. It is managed all the computer until a change and a precipitation of the temperature, and the latest sprinkling method is performed. Two weather stations are established. The growth of the olive is managed according to a kind equally, too. I come to be able to harvest ideal olives every year because I use the latest technique in the whole farm without being greatly acted by climate conditions. The fruit of the harvested olive is carried to the existing compression place in a site same as an olive farm to avoid fermentation of the fruit and crushes it by the cause low temperature compression (cold press) of the complete temperature control immediately. 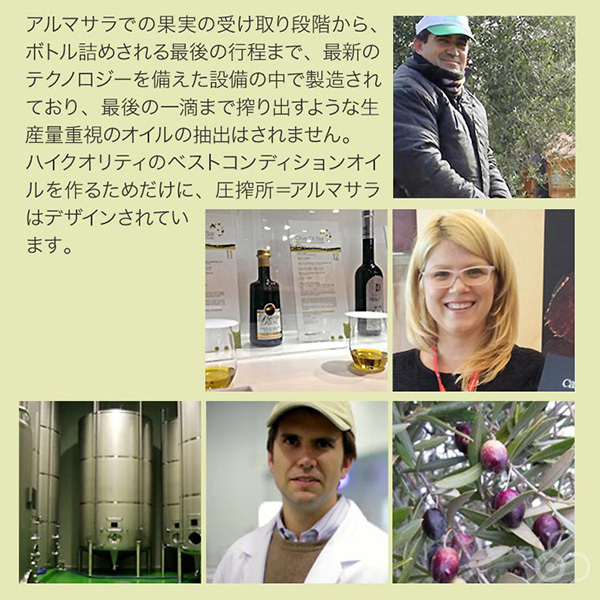 The olive managed with facilities with the latest technology becomes the best quality and the taste with the depth and is reborn to olive oil. Olive brand, it which are avant-garde which were produced by an innovative technique and the power of the person are Casas de Hualdo umbrellas デ ウアルド. The harvest of ideal olive fruit is carried out before temperature falls with the autumn arrival, and freezing is generated. The olive picked directly by a tree of one one is carried to the Al masala (compression place) immediately to prevent deterioration. The compression place of umbrellas デ ウアルド (in Spanish Al masala) exists in a site same as an olive farm. 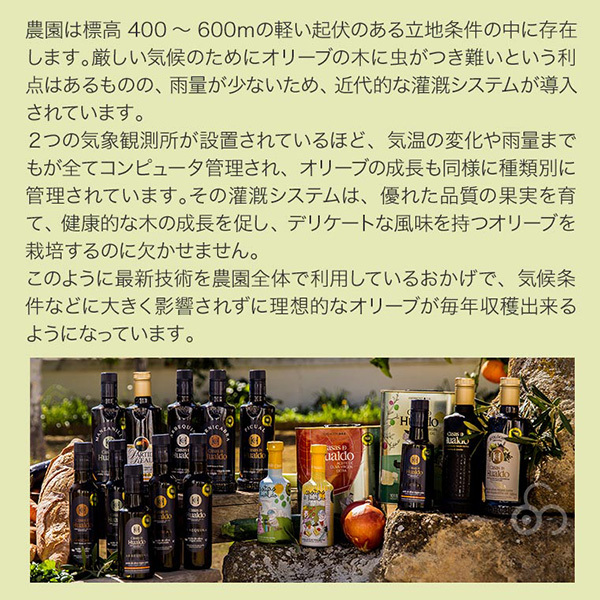 Olive oil sold under the name called umbrellas デ ウアルド is the premium olive oil which selected carefully only by fruit of the best condition. 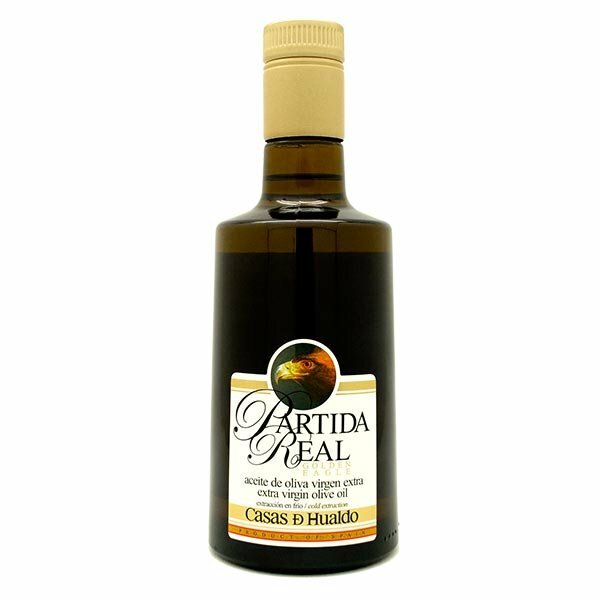 It is not extracted the oil of the amount of production serious consideration that it is carried out in facilities with the latest technology until the last trip packed in a bottle and squeezes to the last drop of the olive from a receipt stage of the fruit in the compression place. Compression place = Al masala is designed only to make the best condition oil of the high quality. 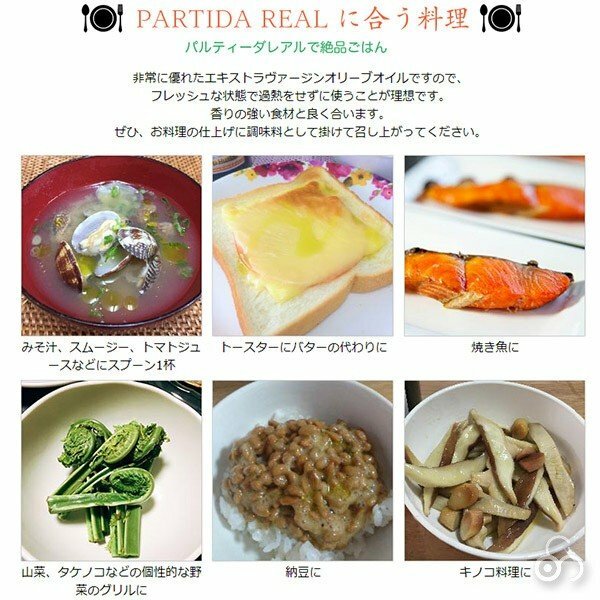 Highest grade extra virgin olive oil umbrellas デ ウアルドパルティーダ real (Partida Real). Free shipping. In November, 2017, I sell it newly! 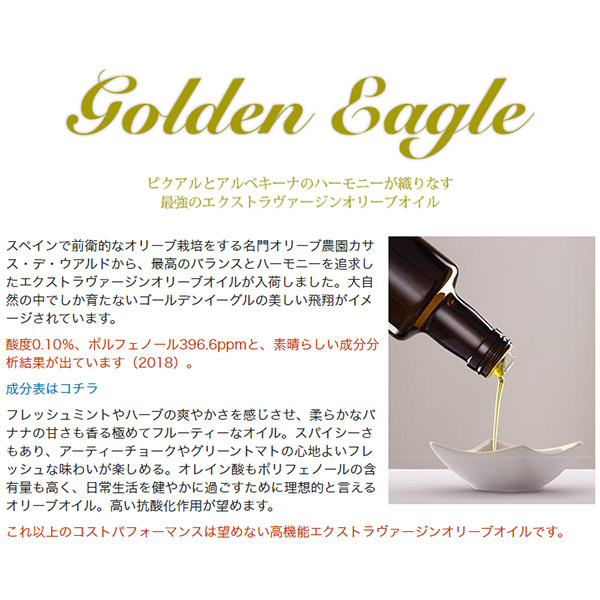 It is recommendation in the eagle which I always use the olive oil for as this oil that a beautiful flight is imaged feels strong green symbolizing Nature particularly. I send it with the overwhelming cost performance that we which are a Japanese authorized agent do not sandwich the middle margin between. In addition, 77.29% of oleic acid content that is very nice for a person minding health, test result called polyphenol level 637.2P.P.m. 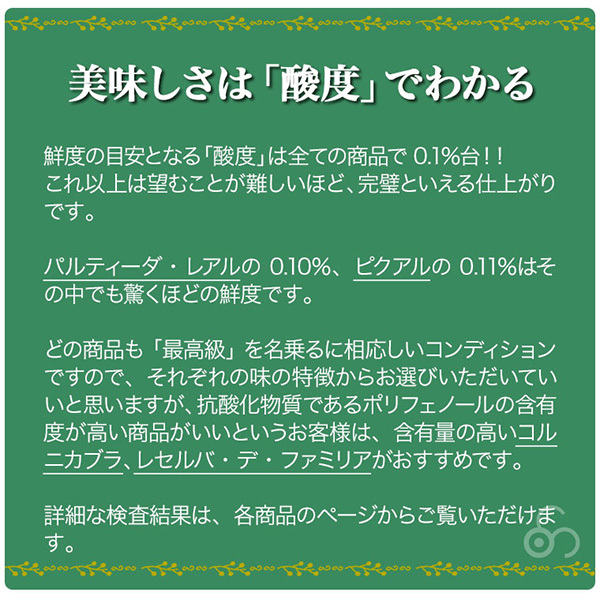 This oil is クパージュ (blend) oil of アルベキーナ and ピクアル. Bitterness and the sharp taste to feel at a throat in addition to mild taste to leave an aftertaste having a long アルベキーナ for elegantly are gifts of the ピクアル class of the Strong type. I am finished for a masterpiece of the extra virgin oil that the balance that I got of the harmony is good. I understand reason to receive a high evaluation in the world.